Beautiful blouse, love the fabric and the fit. Fast shipping! Thank you! ..
As wonderful as expected !.. Jacobo and Maria Angeles produce some of the highest quality Oaxacan wood carvings (alebrijes)in the world. 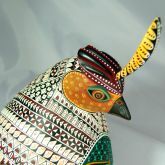 This quail and the other carvings that I have purchased from www.laceiba-arts.de by these same artists are beautiful. The color, designs an..